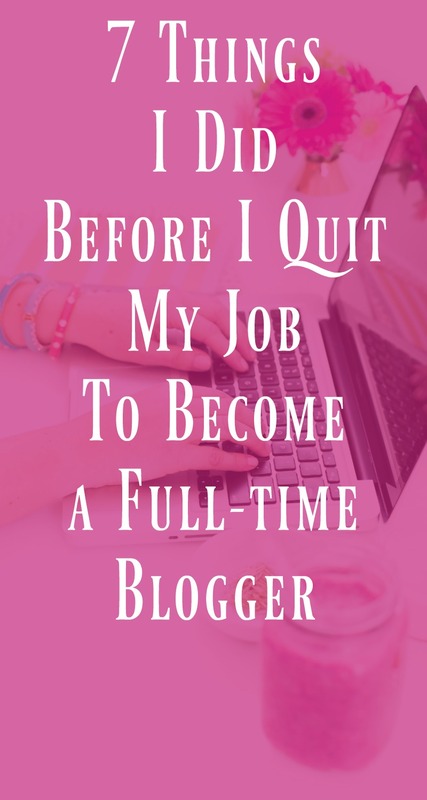 It’s scary to quit a full-time job – especially to become a blogger. Nobody really understands what a blogger does and it’s not like bloggers come on career day encouraging us to start a blog. No, from an early age we are encouraged to take the safe stable route when deciding on a life-long career. I actually feel we’re doing young people a major disservice by not making them aware of their online entrepreneur options. But that’s another post for another time. Anyway, let’s assume you did discover blogging, started a blog, and now on your way to creating a full-time income. Woohoo! Now what? How do you know when it’s the right time to quit? What should you consider before handing in your walking papers. Before I jump into the things I did I want you to think about something. Most full-time bloggers don’t just quit their jobs and start working on their blogs full-time. Of course, some are thrown into blogging because of a job loss or life change but I think most bloggers leave their job after they start making money from their blog. I know it’s easy to look at a successful blog and think they “lucked out” or were an overnight success but I can guarantee if a blogger is making a full-time income, luck had nothing to do with it. Trust me, they put in a lot of time and effort. 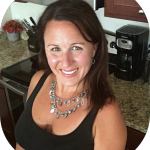 I started my blog Organize Yourself Skinny in March 2011 and quit my job in August 2014 to become a full-time blogger – that’s over 3 years of blogging before I was able to leave my full-time position. Yep, and I worked full-time while building my blog. It wasn’t easy but it can be done. About a year into blogging it became clear I could make money from my blog. 2 years into blogging I was confident I could make much more than I was making in my “secure and stable” state job. However, at that point, I still couldn’t just walk away. Like you, I have bills and they weren’t going to pay themselves. I needed a plan if I was going dive head first into professional blogging. 7 things I did before I quit my job and became a professional blogger. #1. I needed to have a consistent blog income for at least 6 months. My blogging income was very inconsistent during the first couple years. Some months I made over $3000 and other months I made less than $500. This is normal when first starting out and learning the ropes. However, considering my monthly bills are consistent I needed a consistent income to pay them. A year before I quit my job I set a goal. In order for me to quit I needed to make at least $3000 a month consistently for 6 months. Basically, I figured out the amount of money I needed to make every month to cover my bills. Fortunately, I made that and much more which bring me to the next thing. #2. I needed to make as much or more than I was making in my real job. I wanted to leave my job for a variety of reasons – having more flexibility to be there for my kids was a big one. However, I couldn’t just walk away from my job without making just as much money, or more, to feel like it was worth it. Don’t get me wrong, time means more to me than money, but again time doesn’t pay the bills. Plus, I went to college for 6 years. I have a Bachelor’s and Master’s Degree along with the student loan bill to prove it. Therefore, for me to leave a job that I essentially spent 6 years in college for, and $60,000 in tuition to get, it needed to be worth it. Worth it to me meant making my salary or more with a blog. Well, 2 months before I quit my job (6 months into the new year) I did my books and discovered I made MORE in 6 months than I would make working at my state job in a year! And I consistently made that for 6 months. That was the day I decided it was time to quit. I was making enough money and felt confident that I’d only make more in the future. Bye bye soul-sucking state job. Just a side note. My first job out of college (with a Master’s degree) paid me $28,000 a year. My second professional job (with a Master’s degree + 3 years professional experience) paid me $34,000 a year. Both positions made it sound like they were doing me a favor by paying me that much. At the time, I felt lucky to have a job and didn’t really think twice about it – until the student loan payments started. Ouch! Anyway, I was so scared I wouldn’t be able to match my salary by blogging. That fear almost kept me from taking the leap. However, I’m so glad I believed in myself because there’s been months I made my past yearly salary in one month. My point is, don’t be paralyzed by fear or change. It’s okay if you choose a different career path than the one you went to college for. It’s okay to switch gears. I’m not saying it’s easy, and won’t come without challenges, but with vision and hard work there’s a lot of money to be made blogging. #3. Health insurance and retirement. At the time I didn’t have to worry about health insurance because I was married and under my husband’s. I’m legally separated now so I’m still covered under his health insurance but soon I’ll be divorced and will need to provide my own coverage. I bring this up because I know health insurance is a major concern for many people. Just like with money, don’t let the fear of health insurance stop you from becoming a professional blogger. We are not the first people to purchase our own health insurance. The world is filled with entrepreneurs. My advice is to research options and talk to someone who can give sound advice about self-employment and health insurance. Knowledge is power. Do this now so you’re ready when the time comes to hand in your resignation. The same goes for retirement. I worked for NY state which meant I had a pension along with a separate retirement account. Well I walked away from my pension and the retirement account disappeared in my divorce so I had to start at zero with retirement. At 40, that’s a little scary. But instead of letting fear get the best of me I got a financial adviser who set up a new retirement account for me. Of course, you want a retirement account for when you retire but, as an entrepreneur, you absolutely need it to reduce the tax burden. This isn’t something I did before I quit but wish I did. If you’re concerned about health insurance and/or retirement then I recommend sitting down with a financial advisor and accountant. #4. Get your accountant on board immediately. Prior to quitting your job I highly recommend making an appointment to sit down with your accountant. As an entrepreneur, your accountant will become a close friend. Keep in mind that blogging is not a well-known career and it’s very likely your accountant will think your nuts. Don’t worry once they see the cash coming in they’ll start think very different. Anyway, at this appointment they’ll give you an idea of quarterly taxes, tax write-offs, and generally what to expect during tax time. Do not, and I repeat DO NOT, wait until tax time to throw on him (or her) all your 1099’s from the 10 different companies you’ve received money from – trust me, that won’t end well. Once you’re self-employed you need to think about taxes ahead of time and meeting with your accountant is the best way to do that. Of course, I’m not an accountant, so I can’t give tax advice. All I can say is you have the potential to make LOTS of money and with lots of money comes lots of taxes so do yourself a favor and sit down with your accountant. #5. Get money in the bank. In addition to making a consistent income, and matching my salary, I wanted to have money in the bank before quitting my job to become a full-time blogger. Having money in the bank is good no matter what but when you’re quitting a job, and making such a huge life change, it’s essential. For one, it will give that safety net just in case a month doesn’t go as good as you need it too. Second, you don’t get paid at the same time every week. This takes some getting used to so there might be times where a bill needs to get paid and you forgot to set money aside. In this case you can dip into the money you saved. Last, and most importantly, it gives peace of mind. Once you’re ready to quit it’s likely your blog is already making a consistent income and there’s not much to worry about financially. What’s great about blogging is the harder you work the more money you make. It’s not like what you’re used too in a corporate or state job where no matter how hard you work you still get the same paycheck week after week….after week. Honestly, with blogging the sky’s the limit. There’s always a way to increase your income. Regardless, it still feels good to have that safety net. The amount of money saved is different for everyone. Personally, I like to have 2-3 months of bills saved at a time. I’d say figure out the amount that would make you feel confident leaving your job, then start saving. Give yourself at least 6 months to get a safety net in the bank. #6. Get ahead of the game. Before you quit I highly recommend getting 2-3 months of your blog planned ahead of time. This means writing blog posts, scheduling social media, writing email newsletters, and possibly some other blogging tasks. I know you’re going to have a lot more time to work on your blog once you’re doing it full-time but starting ahead of the game will provide confidence. Imagine that first day and you’re already 3 months ahead of the game – trust me, that’s a great feeling. Plus, having your blog planned out in advance will free up time to start working on larger projects. Think about it, that first day can be focused on an ecourse you’ve been wanting to create. #7. Have a long-term strategy. Like I said earlier, the sky’s the limit with making money from a blog. There’s so much room for growth and many directions you can take your blog in. What your blog looks like right now is going to be very different a year from now or 5 years from now. The question you need to ask is “how am I going to continue to grow my blog?” What does that look like? You don’t want to show up on your first day saying “now what?” You need to be ready to work. Here are some things to consider with a long-term blogging strategy. How will I grow my email list? Opt-in forms, challenges, email series, etc. How will I use my email list to build community with my readers? How will I grow traffic using Pinterest, Facebook, Instagram? How will I write posts that show up in search engines? How will I grow my income streams? Affiliate marketing, ecourses, advertising, etc. Don’t let this overwhelm you, these are just examples. Instead, get excited because this proves there are so many ways to keep your blog growing and making money. Without a doubt, you can make money blogging. In fact, it’s very likely, if you work hard you can eventually quit your job and become a full-time blogger. When that time comes make it exciting, and not scary, by being prepared ahead of time. Do you have anything to add to this list? Let me know if you have questions. 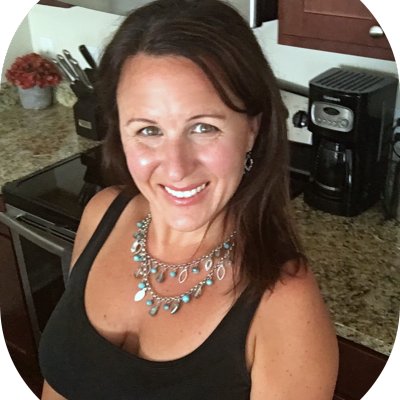 Sign up for my free newsletter and receive my best blogging tips to help you make the move from hobby blogger to professional blogger. « 6 Important Tips to Remember If You’re Serious About Starting a Profitable Blog!